As I have discussed in several of our recent member newsletters, HumanaNatura is in the midst of a broad but important change to our programs, one that will place greater emphasis on the ecological or Permaculture benefits of our science-based system for modern natural life and health. To begin to introduce these ideas beyond our member community – and in advance of changes to our online programs and a series of related Natural Truth posts beginning in 2015 – I’d like to discuss a crucial way the HumanaNatura natural health system is better for the environment, and not just for us and our communities. 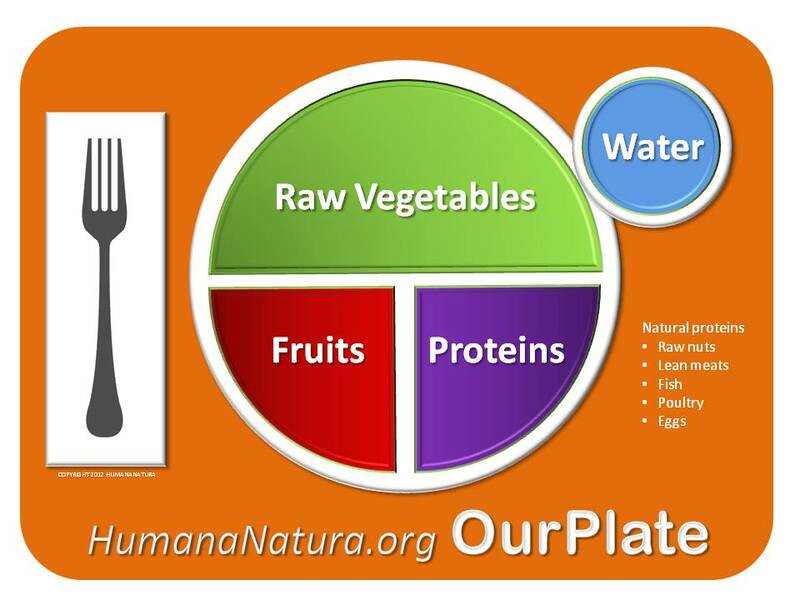 The area I want to focus on today is the important environmental benefits of our nutritional recommendations, or technique of Natural Eating, which are encapsulated in HumanaNatura’s OurPlate healthy eating guide. 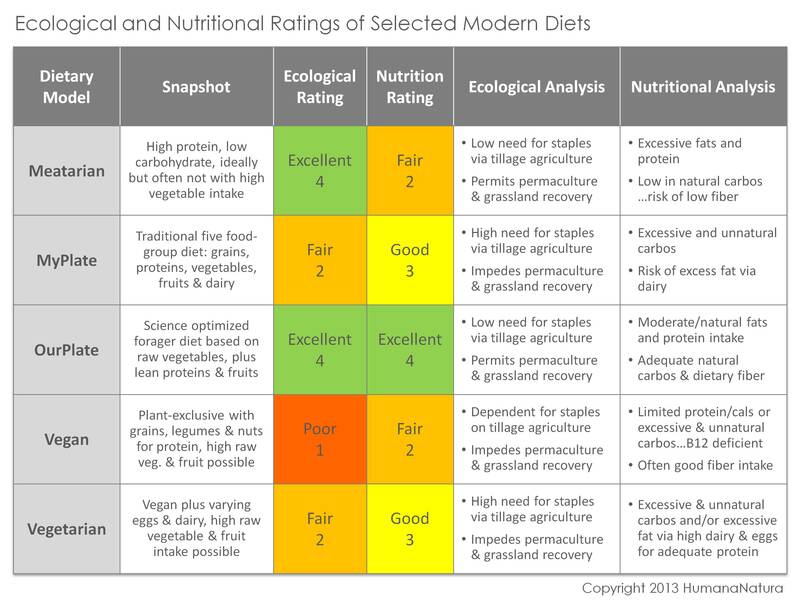 You can click OurPlate Graphic to understand the general dietary approach we recommend, which is intended as a modern, science-based re-interpretation and refinement of our original hunter-gatherer diet in nature. You will notice that the OurPlate model encourages our avoidance of many agricultural age foods, including carbohydrate-rich grains, beans, and starchy root plants. In addition, the approach makes no room for industrial foods of all kinds. > Earth – HumanaNatura’s recommendation of a diet free of grains, beans, and other soil-eroding mono-crop annuals – and their discontinued use as animal feeds in favor of grassland and other renaturalized animal feedstocks – means that the HumanaNatura diet eliminates and even can reverse modern agricultural soil erosion. As you might know, ongoing soil loss and degradation from traditional and modern agricultural practices is an enormous but often poorly appreciated ecological and societal problem today. It is even a slow but looming threat to the health and survival of the modern world (see Wikipedia Land Degradation). In place of soil compromising and dietary carbohydrate elevating annual stable crops, HumanaNatura recommends protein-rich animal foods, including yogurts, as well as perennial nuts and seeds. And for our needed carbohydrates, we advocate obtaining them primarily from perennial fruits. Importantly, while it is true that our dietary approach advocates large amounts of salad vegetables, we would point out that these annual foods easily can be grown sustainably, simply by composting food waste from other parts of our recommended diet and then using this organic material to offset garden vegetable soil loss (while often improving overall soil quality and increasing food yields). > Wind – the term wind is used here to refer to increased greenhouse gasses, including carbon dioxide and nitrous oxide, caused by human activities (the gas methane is discussed separately below). While it is true that traditional and modern agricultural crop plants do consume and store some amount of atmospheric carbon, with storage occurring both in their structure and adjacent soil, overall annual agriculture is an enormous net contributor to greenhouse gasses (see Greenhouse Gas Emissions From Agriculture). This net greenhouse effect from agriculture owes to the materials contained in required agricultural fertilizers (owing to soil degradation), machinery used to produce and distribute these fertilizers, and the disruption of natural carbon-binding and other processes within natural soils (ultimately promoting desertification). Again, since the HumanaNatura approach uses annual agriculture only minimally and sustainably, the problem of increased greenhouse gasses from agriculture is greatly reduced. Indeed, a return to grassland and other renaturalized forms of agriculture has the potential to restore vast areas of land desertified by past agricultural and grassland management practices (see How To Green The World’s Deserts), and to re-sequester significant amounts of carbon, while improving rural economics. > Fire – finally, fire refers to another important greenhouse gas, methane, one that is of course flammable and a strong potential contributor to global climate change. In addition to various industrial sources of atmospheric methane, there are a number of natural ones as well, including the flatulence of large herds of grazing animals. Given this latter fact, increased methane is often cited as a reason that meat-eating should be replaced by vegetarian diets. Unfortunately, this argument fails on two crucial fronts. First, it overlooks the critical soil loss and other greenhouse gas emissions – my earth and wind factors – that naturally and inevitably result from annual monocrop agriculture, whether used to provision vegetarian or more traditional diets. Second, the argument implicitly assumes that healthy grasslands would be animal-free if left alone, when in fact they would gradually repopulate with natural herd species in lieu of domesticated ones (see Bison Restoration for a relevant case study). The ultimate effect of this would be roughly the same amount of animal methane in natural conditions as with grassland agriculture (assuming this agriculture is conducted sustainably). Alternatively, these natural grasslands could be converted to staple crop agriculture, as they often are today, but this would then result in soil degradation and eventual desertification. 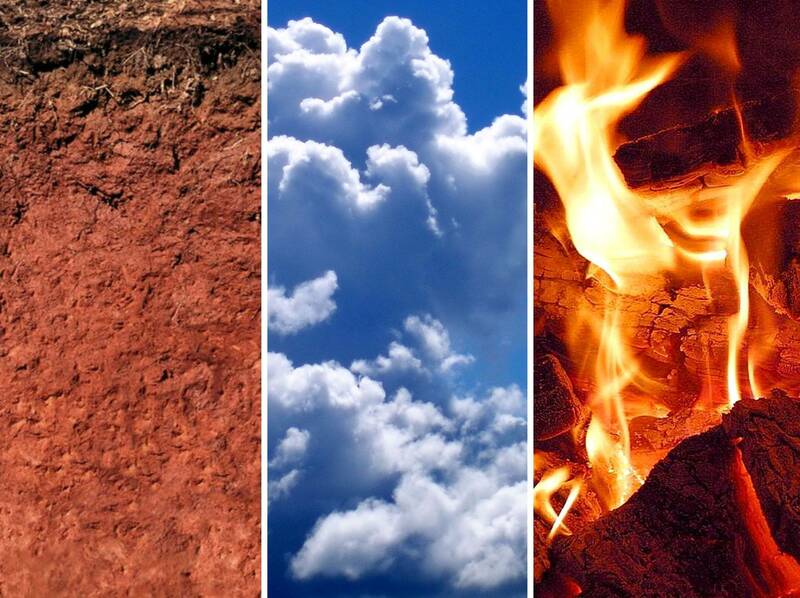 Overall, these three themes of earth, wind, and fire should provide you with a good overview of the crucial and entirely natural ecological benefits of HumanaNatura’s dietary guidelines – ones informed by both modern science and ancient, sustainable hunter-gatherer eating patterns – and I hope they prove informative and useful to you. Often, however, these ideas are new and quite surprising, so don’t be shocked if they take a bit of time to explore and consider. When HumanaNatura releases the seventh edition of its online health programs and publishes follow-up posts in this area, additional links to relevant research will be included. For now, I’d like to underscore that these insights into the ecological impacts of grassland and monocrop agriculture, in addition to others regarding our natural human nutritional needs, lead to what are often unfamiliar and thus counter-intuitive conclusions about the personal and ecological wisdom of various modern diets. I have summarized these ideas above in my Five Modern Diets Chart, which I would encourage you to review and consider. You also can explore these ideas about optimal food ecology and modern nutrition in more depth via our extended article, Permaculture & Human Health. Mark Lundegren is a teacher and writer, and the founder of HumanaNatura. This entry was posted on November 12, 2014, 01:07 and is filed under Natural Eating, Natural Living, Research & News. You can follow any responses to this entry through RSS 2.0. You can leave a response, or trackback from your own site.